There's no spring lunch I love more than this simple watercress salad. With a delicious blend of textures and flavors, it's a light, yet satisfying meal. I have a confession to make – I am not only a terrible gardener, but I’m also a terrible herb gardener. They’re so easy to grow, but they’re oh-so-hard to remember to water. 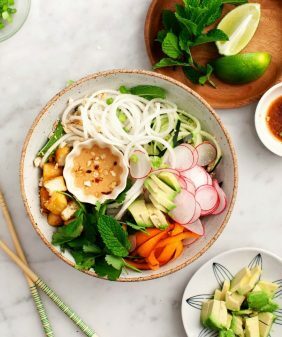 Lucky for me, my mom recently came to visit and planted tons of new herbs, including my favorites – basil and mint – just in time to include them in this salad. 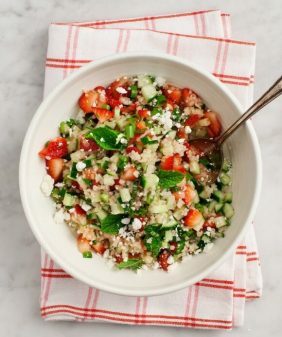 What would spring be without an herby grain salad, right? This one is packed with chewy farro, peppery watercress, and dried tart cherries, which add a necessary pop of sweetness to balance it all out. I’ve talked about the benefit of tart cherries here, here, and here. We love them mostly because they taste good, but they have some real superfood qualities as well – they’re a natural anti-inflammatory and also a good source of melatonin. I love this making this salad for a light spring dinner. 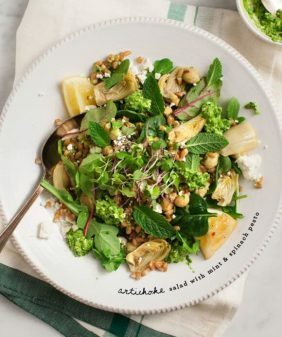 Use quinoa in place of farro to make it gluten-free, and if you can't find watercress, arugula would be good in its stead. In a pot of salted boiling water, cook farro for about 35 minutes or until tender. Drain and set aside to cool. Make the dressing: In a small bowl whisk together olive oil, white wine vinegar, lemon, garlic, maple syrup, salt, and pepper. 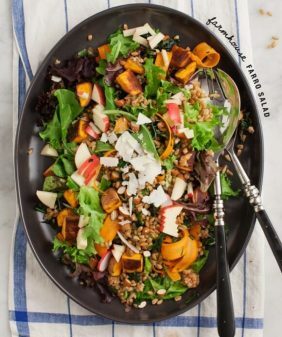 Assemble the salad: Toss cooked farro with watercress, carrots, cheese, dried tart cherries, basil, mint, and sliced almonds. Drizzle the dressing over the salad and toss again. Taste and adjust seasonings. Let salad sit at room temp for 15 minutes, then serve. Store leftovers in an airtight container in the fridge. This makes a great lunch the next day. Such a gorgeous salad. One that is perfect for the upcoming summer. I feel you with the herb gardening. Once the initial excitement is over, watering herbs becomes yet another chore to add to the list. Good luck with the book! Cheers..
My mom just helped me plant a bunch of herbs too! She’s trying to teach me how not to kill them. This looks incredible! I haven’t had farro or cherries in the longest time, but all these herbs on my balcony will be perfect for this dish! I can’t wait to try this. I completely know what you mean about lacking the green thumb. But this is my kind of salad, and I especially love the watercress and cherries in it. I am exactly the same with plants. Love them but don’t ever remember to water them! This salad is so beautiful! I adore cherries. 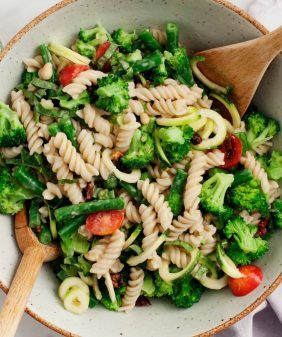 Will definitely be trying it with a gluten free grain! I fell in love with Farro when I was in Italy. I had the BEST salad of my life there which included Farro and veggies with a herb dressing. I wish I had the recipe to share! 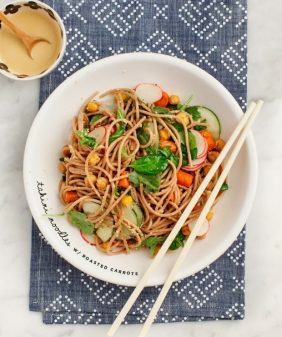 This looks very nice though and a great spring dinner option! I’m a terrible herb gardener too, but I keep buying little pots of them and thinking that maybe this time I will remember to water them… my husband hates it but I know next time I’m at the store I will probably pick up a few more! Mint and basil will definitely be on the list. This salad sounds lovely! Good daughter for watering the herbs until I return. Also, I’m now an official farro lover! definitely! Do you keep them in water? What’s your trick? What beautiful colours and flavours! This looks so beautiful and fresh! I love the colour of those carrots – they add such a gorgeous pop to the salad. I feel like we’re behind most places here in Canada in terms of getting local produce, but hopefully it will show up soon. I am a big fan of fresh herbs but also have a bit of a black thumb when it comes to growing and watering them. Except for mint. Mint just goes and grows wherever! Love the cherries in here — perfect for this time of year in DC as we’re celebrating the cherry blossom festival! Tart plums are very popular here in Thailand, so I’m guessing I could try this recipe and use the plums instead. Either way, it looks delicious. I really like the look of this! Of course, I’m always a fan of salads that include fruit like cherries. But the pics in this look especially great. Will have to try next time I’ve got my hands on these ingredients! I too have a “black thumb”, its ok, we’re all works in progress, right?! 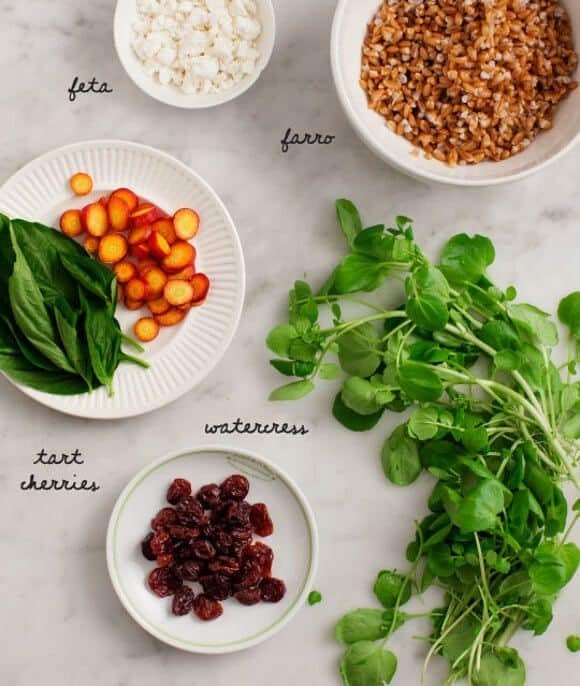 LOVE the sound of this salad… I am falling hard for tart cherries, and I can totally see how they would pair well with some crisp watercress. Thank you for the inspiration!! I absolutely LOVE that you posted a photo of the ingredients and provided the name!!! 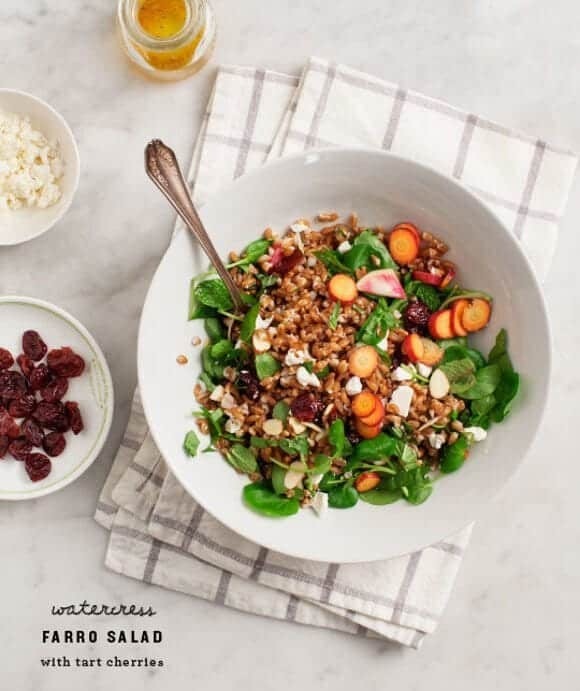 I am not familiar with watercress or farro but since I am quickly reviewing my in-box, I didn’t have enough time to do a search to find out. This is so great that I took time out to let you know it is so helpful! Thank you so much!